Ronald Kasrils was born in Yeoville, Johannesburg, on 15 November 1938. His grandparents were immigrants from Latvia and Lithuania, who had fled from the Czarist pogroms at the end of the 19th century. His father was a factory salesman and his mother worked as a shop assistant. Kasrils matriculated from the King Edward VII High School (KES), and excelled in athletics and history. His initial career was as a script writer for a Johannesburg film studio and then for Lever Brothers, as Television and Film Director for their advertising division in Durban, until 1962. The Sharpeville massacre prompted Kasrils to join the African National Congress (ANC) in 1960, serving as the secretary of the ANC-aligned Congress of Democrats (CoD) in Natal until it was banned in 1962. His involvement led to his being banned from gatherings and various forms of employment, and having his movement restricted to Durban. In 1963, he registered to study a Bachelor of Arts degree, and joined the Cross Country Team at the University of Natal. His plans were cut short when the security police sought to arrest him under the draconian Terrorism Act. However, Kasrils evaded arrest and began operating underground. Kasrils was a member of Umkhonto we Sizwe (MK), the ANC’s military wing, since its inception in 1961. He was involved in its first operation, and in 1963, he became the Commander of the Natal Regional Command of MK. On the run from police, wanted notices were posted declaring him “armed and dangerous”. Kasrils eventually joined the ANC in exile where over the next 27 years; he served in various capacities in London, Luanda, Maputo, Swaziland, Botswana, Lusaka and Harare. Alongside the late Joe Modise, then MK Commander, and Commissar Moses Mabhida, Kasrils completed a general military course and a military engineering specialist course, graduating from the Odessa Military College in the Soviet Union at the end of 1964. He then went on to complete a specialist course in intelligence and a general officers course at Brigadier level. Therefore in 1983, Kasrils was appointed Chief of MK Intelligence. Kasrils served on the ANC’s Politico-Military Council (PMC) in Lusaka from 1985, of which Joe Nhlanhla was secretary. He also served on the National Executive Committee (NEC) from 1987 and on the South African Communist Party’s Central Committee (SACP) from 1985. Kasrils also worked closely with the late Mzwai Piliso, who was the ANC’s head of security and intelligence, during his deployment to Angola as a political instructor in 1977 and later as Regional Commissar. Just before the unbanning of the ANC in February 1990, Kasrils played an active role in Operation Vula which aimed to infiltrate leadership back into South Africa. He consequently lost the indemnity given to returning NEC members by FW de Klerk’s government – and again was on the run from police, this time until June 1991.In July 1991 he was elected to the ANC’s NEC and in December, that same year, to the SACP’s Central Committee. He served on these structures, until 2007. From 1991 to 1994, Kasrils also headed the ANC’s Campaign Section at the organisation’s headquarters in Johannesburg. Kasrils was an active participant in the negotiations between MK and the former South African Defence Force (SADF), and a member of the Transitional Executive Council’s Sub-Council on Defence. In 1994, Kasrils was appointed Deputy Minister of Defence to the late Joe Modise, serving in the position until June 1999. During this period he assisted Modise in the amalgamation of the previous adversarial military forces into a new South African National Defence Force (SANDF) and was engrossed in overseeing its transformation programme. 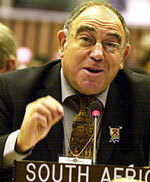 From a military position, Kasrils was then elected Minister of Water Affairs and Forestry from 1999 – 2004. Modise explained that his background had in fact helped prepare him since “the rivers and forest of the country and region were part of his natural habitat and sanctuary during the liberation struggle”. Kasrils described the metamorphosis as “from fire to water”. His most fervent wish, he said, was “to deliver safe water to the poor, the weak and the hungry”. In his capacity as Minister, he played a prominent role in the establishment of the African Ministers Council on Water (AMCOW), and participated in various international water conferences, including the Johannesburg World Summit on Sustainable Development (WSSD). On his appointment as Minister for Intelligence Services in April 2004, Kasrils reiterated his commitment to working towards the safety, security and prosperity of South Africa. Married to Eleanor (nee Logan) since 1964, they have a daughter, two sons and two grandchildren. Eleanor too has a long history of political involvement. As member of the ANC and MK, she was arrested by the security police in Durban in 1963 – but outwitted the authorities and managed to escape from custody to join Kasrils before the couple were instructed to leave the country. While in London, Eleanor studied geology and worked in various educational institutions. In 1992 she worked as archivist to the late Oliver Tambo. Kasrils is also passionate about international affairs, and believes that as a South African of Jewish origin he has a moral obligation to speak out against Israel’s unacceptable policies and has founded a South African solidarity group called “Not in my Name”. He has written numerous articles and letters on the issue, and in February 2004 met the late President Arafat in Ramallah. He has been to Palestine several times and with the Palestinian Ambassador to South Africa, Ali Halimeh, has founded the broad based “End the Occupation” committee. In April 2004, United Nations Secretary General Kofi Annan invited him to serve on his Advisory Board on the attainment of the Millennium Development Goals for Water and Sanitation. Kasrils was also invited to deliver the Inaugural “Sir Richard Jolly Lecture” – who is the past Chair of the Water Supply and Sanitation Collaborative Council (WSSCC) at the United Nations. The lecture was delivered on 30 April 2004, just two days after his appointment as the Minister for Intelligence Services. Following the unbanning of the political organizations and the creation of a new democracy in South Africa, Kasrils continued writing, and his works have appeared in South African newspapers and international journals. From 1994, his articles became focused on defence, development, water resources and forestry, and the Israeli-Palestinian conflict. Noteworthy articles among these are: “David and Goliath – Who is Who in the Middle East”; a pamphlet published by the ANC, 2007 and “The Paradox of Cuito Cuanavale”, a paper presented at a meeting in Havana, April 2008, on the twentieth anniversary of the Battle.